An underbite is a common condition that requires unique treatment. The team at Zaytoun Orthodontics has extensive experience treating underbites in Raleigh, Cary, and Garner. Unlike overbites or other common issues with the jaw and teeth, an underbite will not go away on its own. 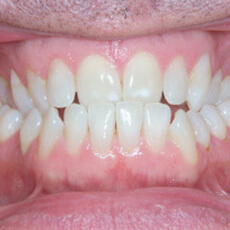 Almost every underbite will require treatment from an orthodontist – the earlier, the better. If you need orthodontist treatment in Raleigh, Cary, or Garner, Zaytoun Orthodontics can help treat your underbite. How do you correct an Underbite? When it comes to underbites in children, teens and young adults, early diagnosis and treatment planning are crucial. As patients get older, it gets more difficult to treat an underbite as wear and tear worsens on the jaw and teeth. No matter your age, don’t let an underbite cause you pain, our orthodontists in Cary, Raleigh, and Garner can help! At Zaytoun Orthodontics, we treat underbites in our Cary, Garner and Raleigh locations using braces and a variety of orthodontic appliances. Schedule your consultation appointment today! Are you ready to schedule your free consultation?